It gives us great pleasure to post this guest blog by Kevin Haines and Steve Case outlining the argument for a child and young person-centred philosophy and practice in the world of youth justice. In doing so we are conscious following the break-up of local authority Youth Services that a significant number of youth workers are now employed within youth justice or restorative solutions teams. All being well we hope to organise some sort of Positive Youth Justice/In Defence of Youth Work joint event in the near future. 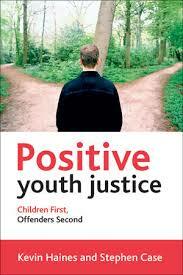 In our new book, Positive Youth Justice: Children First, Offenders Second (Haines and Case 2015), we assert that it is essential for all youth justice professionals to have a guiding philosophy of practice for their work with children; a sense of objective and purpose to frame and animate their knowledge, expertise and skills. We propose the Children First, Offenders Second (CFOS) model, which is underpinned by a series of child-friendly practice principles: child-appropriate techniques within a systems management framework, enabling children to access and actualise their rights and entitlements, facilitating social inclusion through children’s participation and engagement and responsibilising adults to pursue these principles with the objective of promoting positive outcomes for children. Youth justice policy and practice has been dominated by neo-liberal responsibilisation, whereby children, parents, communities and practitioners are held responsible for the perceived psychological and social ‘failings’ and ‘deficits’ associated with offending behaviour and the failure of formal interventions to prevent offending. CFOS seeks to address this insidious responsibilisation by helping children to become responsible for their behaviour as adults, rather than making them (fully) responsible for their behaviour as children. Responses to children’s behaviour should be child-friendly, child-appropriate and meaningful to children – in full recognition of each child’s place on their developmental trajectory. Too many children who offend are victims themselves (e.g. of abuse, neglect, crime, socio-structural disadvantage). Punitive and responsibilising approaches only serve to further victimise children and are ineffective in reducing crime and meeting the needs of victims. Our central argument is simultaneously reactionary and progressive. It is reactionary against the way in which youth justice policy and practice ‘others’ children and subjects them to (possibly well-meaning) interventions which are ultimately punitive, controlling, stigmatising and harmful. We direct this criticism with particular vigour to the ‘new youth justice’ policy and practice of the post-Crime and Disorder Act 1998 era with its emphasis on risk and the demonisation of children – notably through the anti-social behaviour crusade and the criminalisation of the prevention agenda. In progressive terms, we argue that children in the Youth Justice System (YJS) should be treated as children first and foremost. This is both a philosophical, principled position and a policy-practice imperative. In its simplest form, CFOS means de-emphasising treating children who offend as ‘offenders’ or in terms of their offence and emphasising responses to children that recognise their status as children. CFOS demands adherence to children’s rights and attendance to socio-structural inequalities within a progressive mind-set that prevention is better than cure and that children are part of the solution, not part of the problem. Responsibilising adults, not responsibilising children – children are not given the full social responsibilities of adulthood, so it is wrong to invoke this responsibility when they come into contact with the YJS. Instead, adults should take full responsibility for facilitating children’s access to their rights and entitlements and for promoting social inclusion, participation, engagement and positive outcomes for children. Therefore, in opposition to risk-based youth justice, CFOS seeks to promote, not to correct; to responsibilise adults, not responsibilise children; to divert into child-appropriate intervention, not to interfere and stigmatise. CFOS treats offending behaviour as a developmental aspect of children’s lives (it normalises offending) and thus treats children as children, not as offenders. The model offers practitioners a set of principles and a reason to come to work; it offers children who come into conflict with juvenile justice systems opportunity, participation and positive engagements to enhance the quality of their lives. Kevin Haines is Professor of Criminology and Youth Justice at Swansea University and Steve Case is Associate Professor of Criminal Justice and Criminology at Swansea University. Oh how needed this is. I worked in a YOS and absolutely hated working in Youth Offending as a result. Just walked out one day. It had nothing to do with the YP. As a youth work practitioner, it was just soul destroying. Both the approach and the treatment of YP, which staff were forced to adopt. As a result I would never work in that service again, unless it was to make a difference in terms of policy. How they expected to change behaviour at this YOT, when the treatment was so hostile was just beyond me. Today the Ministry of Justice has launched a review of the youth justice system, to be carried out over the coming months, reporting to the Secretary of State in summer 2016. Lord McNally, our Chair, has formally welcomed the review. The YJB has been clear for some time that there are a number of drivers which justify a broad review and reform of the youth justice system: in particular the significant changes in the cohort of young people in the system, major changes to the partnership landscape it operates within, and the significant financial pressures faced by youth justice services and their partners. This review, commissioned by the Justice Secretary, presents a welcome opportunity to pursue this type of wholescale reform. The terms of reference for the review are broad, and include developing a clear understanding of needs and complexities of the young people in the system, how the system and its partners are able to respond to these, and whether the governance and leadership of the system supports effective delivery. The role of the YJB will be considered, alongside the role played by government departments and local government in delivering effective youth justice services. The YJB has offered its full support to the review team, and we will want to make sure we take every opportunity to put across the voice of the sector in discussions that take place. Some of you will already have been contacted regarding an initial round of visits for the review lead, Charlie Taylor to take place over the coming weeks. He is keen to hear from practitioners about the operation of the system, the challenges they face and to identify the priorities for the review to focus on. We will look forward to working with you to ensure we make the most of this opportunity for youth justice. We will use all our normal communications to keep in touch with you as the review progresses, as well as considering what bespoke communications may be helpful in addition.